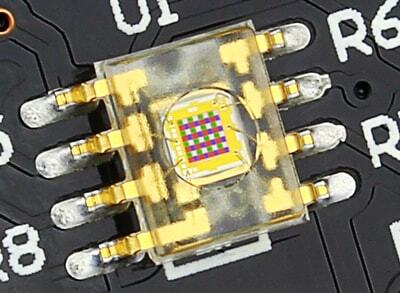 The TCS3200 is a color sensor which has an array of photodiodes. To detect color, the photodiodes are arranged in groups of four with red, green, or blue filters on three of the photodiodes and no filter on the fourth. This allows the sensor to measure the amount of red, green, blue, and white light that hits the sensor. This module incorporates four white LEDs to illuminate an object of which you wish to measure the color of. The white light from these LEDs hits your test object and reflects back to the module's sensor, which then measures the amount of red, green, blue, and white light that was reflected. As is, this module is susceptible to ambient light. We recommend creating a shroud to keep ambient light out of the test area or use the sensor in a dark area with little ambient light to get better results. This module does fit on a standard breadboard, but it spans the width of the standard prototyping pins, requiring connecting wires to be connected to the breadboard under the module. One of the white light LEDs did not work. Replaced all of four of them to get uniform illumination. Now it works. Revised 12/30/2016: Addicore contacted me and corrected the situation. Kudos to Addicore! Way to stand behind their products! Make sure to contact them if you have any problems.